As part of the ComPoint system, the elegant ISK3 Door Station rings your doorbell and provides two-way communication with visitors at your door. 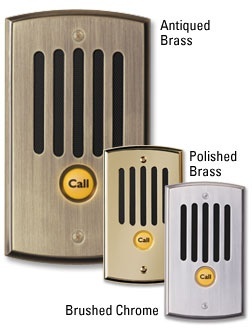 Each of two Door Stations may have its own distinctive door chime for easy recognition. Completely weatherproof, the ISK3 is available in your choice of polished brass, antique brass, and brushed chrome. A subtle amber backlight makes it easy to find the doorbell button in the dark.